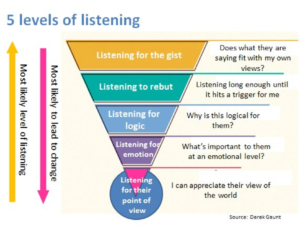 “Did You Know There Are 5 Levels of Listening?” I was asked in blog which appeared in my Twitter timeline. I tend to be suspicious of models making complex communication activities simple. Moreover, I wrote about ‘active listening’ quite some time ago, so, I thought, time has come to have another go. Before I tell you about levels of listening, I would like to draw your attention to the question from the beginning of this post. It’s interesting because it doesn’t tell you that there are 5 levels of listening, no, it presupposes it. This is important because the very claim the blog makes is not argued, it’s not suggested, it’s not proposed, it is simply taken for granted, as if it were obvious truth. I find such tactics disingenuous. It is also worth noting that web address of the article contains the question “Did you know that there are 4 levels of listening?”. Of course, it might have been just an unimportant mistake, but it could also be that the author first had four, then thought of one more, which took him to five, but the address was already there…. And let’s face it 5, admittedly, is better than 4 in every respect! And yet, the claim is still put into the presupposition of the sentence. Beware presuppositions, I would say. This list makes no sense, in my view – it’s simply not coherent. Listening in order to do something surely is not on the same scale as ‘listening for the gist’. Moreover, I doubt very much there is anything like pure rebutting – surely, one does rebut something, you know, like the point of view, logic, emotions. I don’t think you can rebut a phrase, though, as the blogger suggests. Now, listening for the gist, apparently, involves intermittent listening and I have no idea why. Surely, it’s exactly the opposite, it is precisely continuous listening, perhaps not particularly attentively, that allows me to get the gist, no? Otherwise, I have snippets. I really have no idea what listening for emotions is. Apart from when signing kumbaya is involved, I don’t think I want to make any claim about people’s emotions. In fact, the assumption of reading emotions off text (or faces?) irritates me no end. One level beyond that is where we listen for what their argument, phrase, or statement says about who they are in world. What does it symbolize or represent to them? This is where we filter their emotion and logic through a prism of empathy. It is where we should be as negotiators. Getting beyond the cursory level of understanding to a deeper appreciation of their world view. If we do not understand their world view, we do not really understand them. If we do not understand them, we will never influence them. It is difficult to maintain this level of listening every waking moment of everyday but we need to be ready and willing to get here when the situation dictates. lacking reference. I cannot even begin to fathom what it means that the prism of empathy filters someone’s emotion and logic. I think it’s psychobabble. Now, you could say that that if this kind of writing brings you business and you can give “level 5 understanding” certificates to whoever is willing to pay for them, that’s absolutely fine. And I would tend to agree with this. So, why am I writing about it? Well, I am writing about it, because I found all this translated into a nice little diagram seemingly ready to be implemented into the National Health Service. If you don’t listen for their point of view, they will not speak to you again. or some such nonsense. And there will be courses upon courses which, just like with communication skills, will teach you the listening skills. And you will be discovering the internal logic, listening for gist and emotions only to appreciate my world view. Gosh, I just can’t wait! In my mind’s eyes, I can see my GP making another pained expression as he ICEs me, but now he will do the real listening. Leaning forward, ears pricked, after I leave, he will score himself 3 and decide to go for a course which will take him to level 4. As I make fun here (or do I? ), I would like to suggest that listening, just like speaking, is context-bound, situated, goal-oriented. It is not only nonsense to suggest that there are those levels of listening, it is utter nonsense to suggest that they are on a scale of desirability, and people’s goals should be attaining such listening skills. Just like speaking, also listening varies and it makes little sense to suggest that when you engage in delivering a lecture, in making love, or in a job interview you will be listening in the same way. It is nonsense because your communicative and social goals in such situations are likely to be very different and you will adjust. When I speak to my children I listen differently to when I speak to my mother and very differently to when I listen to my colleagues or shop assistants. The context of our listening, following Halliday, depends on the nature of communicative and social activity we take part in, the interpersonal situations we construct for ourselves, and the role language is playing in all this. To suggest that there is some uniform listening, which has a number of levels which we switch on when someone starts talking makes no sense at all. There is more. What the author of five levels of listening seems not to realise is that listening is also negotiated. I don’t think people expect to be listened to in the same way regardless of the context in which they are. In other words, when I sit over dinner, with a glass of wine (or four) I don’t think that whoever speaks expects me to understand the person in the world. On the other hand, when my child tells me about university, assignments and the uninterested staff member, he or she probably does want me to listen intently (whatever it means). And in the former situation, I don’t, in the latter, you bet, I do listen intently! However, I understand why the diagram is attractive. Just like identifying communication skills which need to be learned, also listening can be reconstructed in terms of levels of attainment without much reference to context. And so, from now on, medics and other healthcare professionals no longer have to worry about here and now, about listening to me. Once again, just like with communication skills, I become irrelevant. Because next to perfect paraphrasing and mirroring, they will be working hard to achieve lever 4 listening skill. Oh yeah! Oh, how I enjoy reading this blog! Critical thinking, that’s what we lack in today’s world. Delighted to hear it and to hear from you, Ola! Thank you.